In February 2011 I posted reports that the DPRK’s west coast was experiencing record-low temperatures and the ports were frozen. Unfortunately for the North Korean people, history is repeating itself. North Korea`s fisheries and shipping industries, two key earners of foreign currency for Pyongyang, have effectively been shackled due to a prolonged cold wave that has frozen waters in the Yellow Sea. 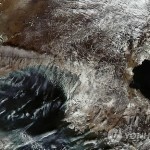 With the temperature reaching minus 10 degrees Celsius for more than a month, more than 40 kilometers of sea water in the Yellow Sea off the North`s coast have been frozen. This is the first time in decades that about 200 kilometers of the North`s coastline from the mouth of the Yalu River to the North`s Hwanghae provinces have been frozen. Experts say the frozen water will not only affect the North’s fisheries and shipping industries, both of which are major earners of U.S. dollars, but also the Stalinist country`s economy and newly launched Kim Jong Un administration. 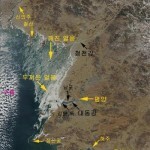 In Seoul, the Korea Center for Atmospheric Environment Research and the Korea Meteorological Administration said Thursday that based on analysis of satellite images, massive ice 40 kilometers wide was detected in North Korean coastlines spanning 40 kilometers from the mouth of the Yalu River to coastal waters off Pyongyang. According to the analysis, Korea Bay located in between the North’s Cholsan and Changyon peninsulas has remained frozen since Jan. 10 due to the cold wave. 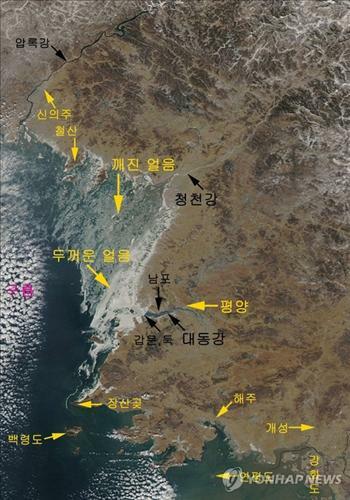 Coastal waters of Unryul County in South Hwanghae Province, the Chongchon River flowing into Korea Bay, and the port of Nampo at the mouth of the Daedong River running through Pyongyang are also covered with ice. Experts blame arctic ice moving south due to global warming for the ice formation. North Korea has been hit by a severe cold snap this winter. According to the South Korean weather agency, the North’s average temperature last month was minus 8.4 degrees, 0.7 degrees lower than in an average year. Temperatures in the North fell further this month to minus 11.1 degrees on average, down 4.6 degrees from an average year. The ice formation in North Korean waters is pressuring the Kim Jong Un administration economically, experts said. The combined share of fisheries and agriculture in the North`s GDP is 20.8 percent, eight times higher than for South Korea (2.6 percent). Fisheries also play a key role in sustaining the North`s economy with catch volume reaching 630,000 tons a year. Waters near China’s Liaodong Bay and Russia’s Vladivostok have also been frozen, causing the North’s maritime transportation to go awry. Due to soured inter-Korean relations, the North`s trade with the South and Japan has declined and raised the Stalinist country’s dependence on China to 56.9 percent. The problem is that ice at sea is growing thicker. 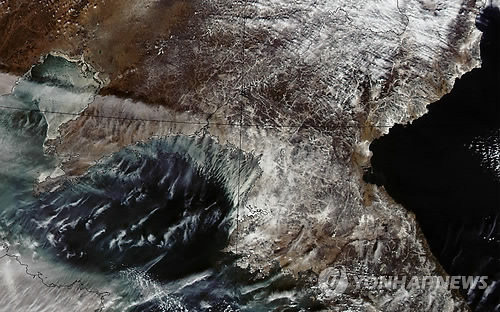 The National Meteorological Satellite Center in Seoul said the boundaries between ice blocks and waters in the North’s section of the Yellow Sea were vague last month, but grew clear this month with ice getting thicker. Chung Yong-seung, head of the research institute, said it is rare for the port to freeze two winters in a row, a development he said could have a negative impact on the North’s fishing industry. North Korea’s catch reached 663,000 metric tons in 2009, the latest year for which statistics are available, according to the South Korean government data. The gross industrial output value grew 1.2 times for twenty days of January this year as against the same period last year. This is the result of the high-pitched drive waged by all the workers of the country since the first day of this year after receiving with excitement the joint calls of the Central Committee and the Central Military Commission of the Workers’ Party of Korea, the joint New Year editorial for this year and the letter of the working people in South Hamgyong Province. In the period, the Ministry of Light Industry increased the production 1.4 times and the Ministry of Food and Daily Necessities sharply boosted the production. Thermal and hydropower stations have increased the ratio of operating the generating equipment. Much effort is being concentrated on supplying coal to the thermal power plants and chemical and metal plants and developing more coal beds. The Ministry of Coal Industry produced 12,000 more tons of coal than planned for the 20 days. Iron mills and steelworks also increased the production. The freight transport volume increased by 12 percent from the same period last year. Innovations were made in the production of vinalon and fertilizer by the industrial establishments in the field of chemical industry and in the production of custom built equipment and mining machines by the industrial enterprises of the field of machine industry. The forestry stations and pit wood stations increased the timber production. Progress has been reported on a daily basis from the important projects including the building of apartments in Mansudae areas and the Paektusan Songun Youth Power Station. For the uninitiated, this is about as close as the DPRK gets to releasing economic statistics. Note there are no base numbers–only [some] % increases. Also, despite the measure being officially named “output value”, it is really just a claim of increased physical production. There is no value (prices) or mention of “services” included in these measures. Unfortunately without more solid numbers, and the proclivity to ascribe productivity gains to effective propaganda, these reports cannot be taken seriously. 5. Bank of Korea’s assessment fo the DPRK economy in 2010. During the third session of the 12th Supreme People’s Assembly, convened on June 7, Kim Jong Il promoted his brother-in-law Jang Sung Thaek to vice-chairman of the National Defense Commission (NDC), named a new premier, and replaced several department heads and ministers. This appears to be an attempt to shore up the regime as it seeks to “open the door to a strong and prosperous nation” by 2012, the 100th anniversary of the birth of Kim Il Sung. Kim Jong Il made a personal appearance at this latest assembly meeting, unlike the SPA meeting held in April. The leader’s presence hints at the importance of the latest gathering. This promotion of Jang Sung Thaek and shake up of Cabinet positions appears to be part of efforts to realize the quickly approaching goal of establishing a ‘strong and prosperous nation’ by 2012, assigning those most able to positions of responsibility, regardless of age or experience. Most notably, Jang, widely thought to be second-in-command in North Korea, was promoted to vice-chairman of the NDC. He was first appointed to the NDC at the first meeting of the 12th SPA in April 2009, making his climb to vice-chairman in a mere 14 months. Before the latest promotion, Jang held the position of vice-director of the Workers’ Party of Korea, a newly created position that he was the first to hold. In this position, Jang oversaw national security offices, police, and the courts, putting him in a position of power difficult for anyone else to achieve. Having traveled to both South Korea and China, Jang Sung Thaek was likely promoted to present the image of a strong military and, at the same time, establish stable relations with the international community in order to ensure a smooth transition of power as well as to resurrect the economy by 2012. When Kim Jong Il led a delegation to China last May, the Chinese government treated Jang very well, ignoring standard protocol for someone in his position. In addition, Choe Yong Rim was named the North’s new premier, and eight new vice-ministers were appointed. Regional Party secretaries were allowed to participate directly, allowing those who are most knowledgeable of local conditions to impact the decisions of the administration. Most of the new appointments were very experienced elites, including Choe Yong Rim (80) as premier, and Kang Neung Su (80), Kim Rak Hui (77), Ri Thae Nam (70), and Jun Ha Chul (82). The regime is promoting a number of veterans who are making their “last stand for the motherland” as part of the effort to ensure stable transformation of power after Kim Jong Il. With Kim Rak Hui’s appointment as vice-premier and new appointments to the Ministry of Foodstuff and Daily Necessities Industry as well as the head of the Light Industry Ministry, North Korea seems to be pursuing the improvement of standards of living promised in the 2010 New Year’s joint editorial. Pyongyang Party officials appear to be attempting to reassert a centrally planned economy in the aftermath of botched currency reform efforts; however those witnessing regional economic conditions appear much more able to come up with appropriate economic policies. North Korea has been unable to make any significant progress in resolving its food shortages or its inability to provide daily necessities to the public, leading the regime to scapegoat some high-ranking officials. Now, many in and outside of North Korea are watching closely to see if the regime can launch economic efforts capable of successfully ‘opening the door to a Strong and Prosperous Nation’ in the next two years. North Korean authorities, recognizing that rationing of processed foods is directly linked to the daily lives of the residents of North Korea, are concentrating on a policy of increasing distribution as part of the campaign to build a ‘Strong and Prosperous Nation’ by 2012. The policy calls for the construction of regional food processing facilities throughout the country and using domestic ingredients for all processed foods. In addition, the government plans to undertake diversification of small-scale factories in order to produce soybean paste, soy sauce, cooking oil and other staples, as well as noodles, rice-cake and other foods, all kinds of side dishes, and alcoholic beverages. This movement was announced in concurrence with Kim Jong Il’s visit to the Samilpo Special Products Factory and Store, both run by the military, on April 7, just two days after the North’s launch of a long-range rocket. This factory, on the bank of the Daedong River, produces over 350 kinds of edibles, including noodles, rice-cakes, oil, sweets, alcoholic drinks, processed meats and fish products. During his visit, Kim Jong Il is said to have stated, “Today, I am happier than during the launch of the Kwangmyeongseong 2,” emphasizing his interest in boosting food production. On July 15, (North) Korean Central Broadcasting announced the formation of construction offices in Jagang, North Pyongan and other provinces to oversee the building of food production complexes, and the dispatch of “shock troops” to bolster construction efforts. Recently, the construction of large-scale factories to produce foodstuffs out of each region’s local stock has been pursued in every province in the country. Even at the Cabinet level, a ’Production Workers’ Conference’ was held, bringing together responsible authorities and local production experts to discuss a course for quickly improving services provided to the general population. In order to effectively implement the North’s policy of increasing rations of foodstuffs, the Standing Committee of the Supreme People’s Assembly issued an order to establish a Ministry of Foodstuff and Daily Necessities Industry. As North Korea tries to implement this type of measure to boost production and rationing, failure to improve food shortage conditions and economic hardships while at the same time mobilizing the population in a drive to establish a Strong and Prosperous Nation has led to growing outcries among residents. North Korean authorities appear to be introducing these measures in order to placate these complaints. The Standing Committee of the North’s Supreme People’s Assembly announced, through a cabinet order on July 22, the establishment of a new Ministry of Foodstuff Manufacturing. According to (North) Korean Central Broadcasting, the standing committee created the new bureau with Cabinet Order 161, but no further details were revealed. The designation of ‘Ministry’, however, indicates that the new entity will be under the control of the Cabinet. At the first session of the 12th Supreme People’s Committee, last April, the Cabinet identified 37 government facilities, including three committees, thirty ministries, two bureaus, one institute, and one bank; the establishment of this new Ministry of Foodstuff Manufacturing brings the number of offices under Cabinet control to 38. It appears that the establishment of such a ministry is closely tied to the regime’s efforts at improving the daily lives of the people of North Korea as it strives to achieve a ‘Strong and Prosperous Nation’ by 2012. North Korean authorities have shown an awareness of the need to raise the standard of living for the average resident. After inspecting the Samilpo Special Product Factory and the factory-run store, both operated by the military, Kim Jong Il declared that the store was an example of a significant turn-around in public service activity for the residents of the country. On July 14, a ‘Commerce Sector Leaders Conference’ was held in Pyongyang, with Cabinet Vice-Minister Kwak Beom Ki and Minister of Commerce Kim Bong Cheol in attendance. Discussion at the conference focused on “Tasks and Means for Turning Around Public Service Activities for the People.” Just as was seen last year, North Korea continues to emphasize improving the lives of the people, while focusing on resolution of food shortage issues and ensuring adequate supply of daily necessities, as well as continuing to build housing in Pyongyang. Despite these calls for improvement, however, the continued prioritization of military and heavy industry development, combined with raw material shortages means that no real progress has been made. North Korea said Wednesday it has created the Ministry of Foodstuff and Daily Necessities Industry as the country strives to resolve its food shortage within years. The Presidium of the Supreme People’s Assembly issued a decree on setting up the ministry, the official Korean Central News Agency said in a one-sentence dispatch. It gave no further details. Pyongyang, July 22 (KCNA) — The Presidium of the DPRK Supreme People’s Assembly issued a decree on setting up the Ministry of Foodstuff and Daily Necessities Industry on July 22. You are currently browsing the archives for the Ministry of Foodstuff and Daily Necessities Industry category.